A refreshing salad filled with vegetables. 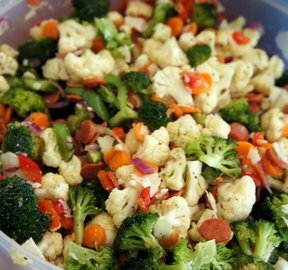 Cauliflower and broccoli covered in Italian dressing is perfect for a light lunch or brought to a picnic. 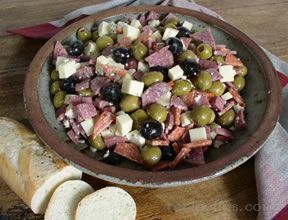 In a large bowl, add vegetables, olives, cheese and pepperoni. Pour dressing over top and toss. 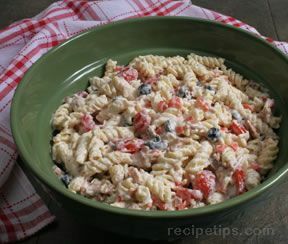 "I make this salad often. 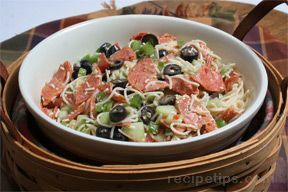 Sometimes with pepperoni, sometimes with imitation crab. I always use Good Seasonings Italian dressing, it's the best around."